In addition to Weddings, The Party Express DJs offer fun and engaging entertainment for your club, private party, or school event. We are also available for your anniversary party, class reunion, non-profit organization, baptism and confirmation, church/corporate picnic, and birthday parties for all ages. We now feature karaoke too! For corporate events we can offer unique solutions for team building, new employee orientations, and holiday parties as well as simple sound reinforcement. If you are looking to add a unique flair to you event, we can do uplighting or wash the room in your corporate color scheme of even do a high powered LED projection of your company logo. We also perform any style of car show as well, whether it is creating a nostalgia theme of the good ‘ol days, or a more cutting edge “Fast and the Furious” style show. If you have ever experienced a New York or Philadelphia style Bar or Bat Mitzvah, then you know exactly how FUN and EXCITING they can be! We can make that full production mitzvah for you or customize a smaller affair for you as well as anything in between. We also work as a DJ/MC teams to motivate your guests and for games and activities with kids. The activities we perform can be enjoyed by children of all ages. Music is screened for offensive language and content as well. 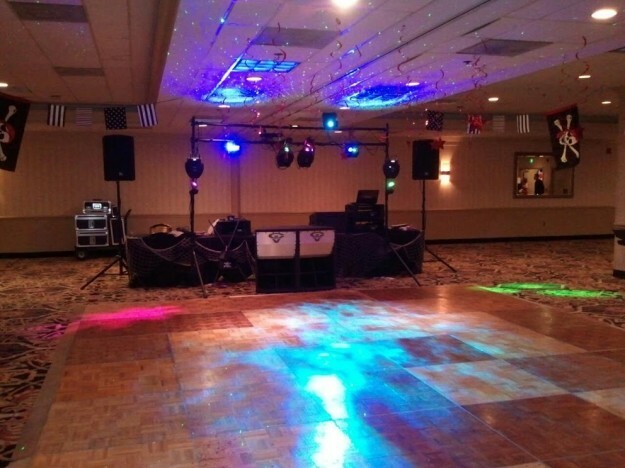 To add a special touch to your event, you can add karaoke, glow products, party props, black lights, custom monograms with your son or daughter’s name projected on floor, ceiling or a wall and a concert style light show. These party enhancers are sure to keep your guests talking about how much fun they had at your event. Our philosophy is to create an event for you that will be enjoyable for guests of all ages and one you will always remember. This is accomplished through pre-planning and listening to what you want and creating a customized event based on your personal preferences. We offer solutions for any high school function ranging from the wildest homecoming dance to an elegant prom and activity filled after-prom party. Our high school packages feature Club Xpress, the Schuylkill Valley’s only mobile nightclub experience. With Club X, you’ll feel like you are in the mix when we bring up to 10,000 watts of nightclub quality sound to your school. Industry standard intelligent lighting is also controlled by a dedicated light jockey in tandem with a club style DJ performance. Club X is such a powerful experience that schools report attendance increases after every dance. Your school can actually make money with this package in the long run. DJs will also be appropriately attired for your event and will play the hottest radio-edited music. In addition to Club X, we can also custom design a dance specifically for your school and have done everything from Glow Parties to Sock Hops and Beach Parties! The newest trend for proms is uplighting the room in your schools colors and also making a custom monogram of your school. And example would be “MHS Prom 2015” projected on a wall, ceiling, or dance floor. Imagine your students dancing and singing along to the hottest new music and classic favorites. Then add in the coolest lighting effects and you have a recipe for fun! Additionally your school will be gaining attendance every dance. We realize that each school is different and we cater to your unique needs. With all dances we perform, music is radio-edited to remove offensive content. Additionally, we try to avoid music that encourages “Grinding” and “Twerking.” When you chose us for your dance, you can chose from a variety of options including our activity dance package, where a little friendly competition goes a long way and is sure to have your students talking about the dance the next day! We can take your birthday party to a new level that is sure to have all your friends talking about “The Party of the Year!” With the hottest radio-edited music, energetic age appropriate DJs, and spectacular lighting effects, you and your friends will be dancing all night long! You can opt for some age appropriate activities that are fun, team oriented, and competitive. Birthday parties are attractively priced to keep parents happy but when you want something over the top, we can do that too. Some ideas would be a black light/glow party, custom monogram of your name projected on wall, ceiling, or dance floor, Uplighting/washing the room in your favorite color, or adding nightclub style lighting programmed on the spot. Our goal is to work with your nightlife venue to create the atmosphere you desire. Whether you want a DJ to mix party anthems all night long or are seeking a rousing night of karaoke, we can customize our service to you. Additionally, we assist in the promotion of your venue through means of Facebook, Twitter, Website and other up and coming social media. We are much more than background music and add a friendly and upbeat personality that a jukebox simply cannot provide. We create an atmosphere that is warm and inviting and will surely have your patrons coming back and spreading the word of how great a time they had at your establishment. The best part about the service we offer is our flexibility. Our DJs are comfortable in any venue whether it be a nightclub, college bar, karaoke bar, or the local tavern. We are your summer patio party authority! Rates are based on number of hours needed, length of contract, and service desired. Some past and present customers include but are not limited to: Captain’s Cove, The Works, Legends Inc., Chill Lounge, Club 1402, Shorty’s, Kutztown Pub, Margherita’s Restaurant & Bar, The Brickhouse, Bowl Grille, All-American Sports Pub, Freymoyer’s Hotel, Fairview Inn, Avenue Grill and Bar, Homer’s Bar and Grill, and Bistro on Bridge. A great college DJ is one who mixes like you hear in the big city nightclubs, knows the college favorites, and gets everyone pumped up. Our staff has these elements in addition to a warm, friendly, personality. We listen to what you want and create activities and events based on your schools needs that extend well beyond a DJ simply playing music. We’ve performed multi-cultural and THON events for Pennsylvania State University, Formals for Philadelphia College of Osteopathic Medicine, welcome back and Greek events for Kutztown University, graduations for Reading Area Community College, and Greek events for Albright College. Additionally, we’ve performed countless events for Alvernia University over the years. Other college events include homecomings, carnivals, mixers, welcome back dances, and student government sponsored events. For the ultimate college party, bring the power of Club Xpress to your school. With Club X, we bring the nightclub to your school and party all night long. This system is ideal for large indoor and outdoor events and features the hottest sights and sounds and DJs spinning on digital turntables. We understand that an elementary school dance is much different than a high school or even middle school function. For this reason we offer our exclusive activity dance package. Imagine all your students dancing to the Cha-Cha Slide or Cupid Shuffle led by an energetic DJ/MC on the mic. Even when we take a brief break from the activities, the music being played is radio-edited and screened for offensive content. This package is perfect for any group of young people from ages 4-12. Our activity dances are gaining such popularity that some daycare centers and middle schools have been using this package for activity/field days. The children’s show is an interactive experience for you and your guests where we use props, toys, and interaction keep the youngsters on their feet the entire performance. For these performances, we play all the favorites such as Cha Cha Slide, The Fox, Wobble, Cotton Eye Joe, Cupid Shuffle, Apache, Macarena, and Chicken Dance but add a twist of imagination and creativity. The Beach Boys hit “Surfin’ USA” goes a long way with a DJ out on the floor with the kids catching a wave under that Blazing California sun! How about a relay race where the kids get to ride a horse, Hula, and race back to pass the horse along to their friends? Our in house specialty, the crab walk limbo, is a new take on an old favorite that the children love. These activities are just a few of the many that we perform during the show. Our entertainers are also young and energetic and relate well with the kids. Consider adding a Children’s Show to add some energy to your childcare center, corporate daycare center, summer playground, first Holy Communion, and even pre-school.